Land turtles, more commonly known as tortoises, are shelled reptiles that live on land as opposed to their aquatic counterparts. Ranging in size from 1/2 inch to 6 1/2 feet long, these herbivores eat mostly plants and vegetables. 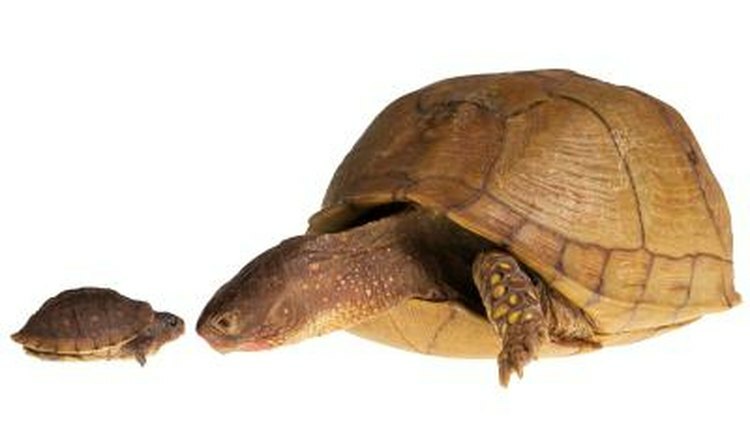 Land turtles can thrive in a variety of different climates, including tropical forests and blistering hot desert sand. It's not uncommon for a tortoise to live well over a hundred years of age. The oldest known tortoise on record, Adwaita, lived to be 255 years old. The Aldabra Giant Tortoise had been given to the Alipore Zoo in India by a British general in 1876, and was assumed to be 150 years old at his death in 2006. However, once his shell had been carbon-dated, researchers found that Adwaita, whose name means "Only One," was actually born somewhere between 1751 and 1756. Land turtles can be found on every continent of the world, except for Antarctica. Tortoises thrive vrom the prairies of the North American Midwest, to the savannas and grasslands of Africa, the deserts of the Middle East and the forests of Asia. On small islands where predators are few, Galapagos tortoises grow to immense sizes. In southeast Africa, the pancake tortoise has evolved to be small and sport a flat shell in order to fit under the rocks and outcroppings of its habitat. The turtle class, of which tortoises are a family, dates back to the late Triassic period. This age coincides with the first dinosaurs, and unlike other evolved species, the land turtle has not changed much from that time period. One difference in the modern tortoise from its ancestor is that Triassic turtles originally had teeth, while the modern tortoise has a beak. These early tortoises were already global; fossils have been found in North America, Britain, China and Germany. Some land turtles such as the Galapagos tortoise can go months without access to food or water, but the desert tortoise of North America can survive for a year with no hydration. This tortoise's water intake comes from the greens and flowers that he consumes and is stored in his body. Later, during the hot dry seasons of the desert, he will hibernate and live off the stored water. Even water in his bladder can be called upon to hydrate this land turtle in moments of crisis.